A sassy Mediterranean metropolis with pulsating nightlife, new avant-garde hotels and daring art galleries. 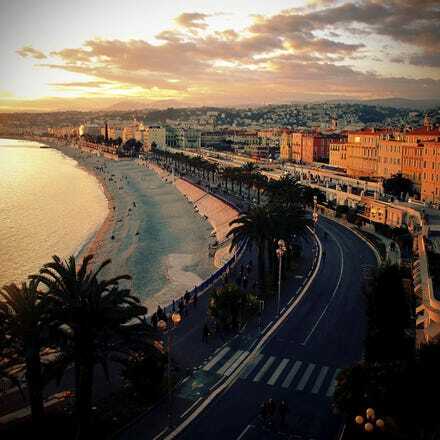 The most fashionable street, the Promenade des Anglais, is the Champs-Elysées of the whole Riviera. Have you already bought your return ticket? Catch a cheap flight with Aer Lingus and enjoy a quick and comfortable journey to Nice. We offer frequent departures to the French Riviera from Dublin Airport Terminal 2. Once you arrive at Nice Airport, our travel partners can offer you great discounts on rental cars, or you can catch a train or bus from the airport into the heart of Nice. The Greeks and Romans did it, as did rich lords, film stars, artists and thousands of tourists. They were just going to pass by, but instead remained in Nice and along the Riviera. Some for just a few weeks, others for months and years. They were too captivated by the light, enchanted by the scents and charmed by the taste of olives, wine and succulent vegetables. All this with a chance to dabble their toes in a turquoise sea! Airport Nice-Côte d'Azur is 7 km outside Nice. The airport bus departs every 20 minutes. A ticket gives you unlimited travel for the rest of the day in Nice. Taxi prices vary, but there is an updated list on the airport web site.